In this installment of my series on Gardner’s Theory of Multiple Intelligences, we’re going to look at what the bodily-kinesthetic intelligence is and how to identify it. Body-smart learners are action-oriented people who love to move and are very engaged with their bodies. They tend to have excellent hand-eye coordination and balance, and ideally learn by physically doing something. This means that hands-on learning activities make a significant impact on their ability to learn and retain new information and/or skills. Other qualities of this intelligence include agility, grace, a sense of timing, strong fine motor control and a gift for using whole-body motions. Is he a good athlete? Does he have a talent for gymnastics? Does she enjoy learning more when it involves physical activity? Speaking as an educator, I have yet to meet a student who did not enjoy and benefit from hands-on learning activities. This is even true of high school, college and adult learners. 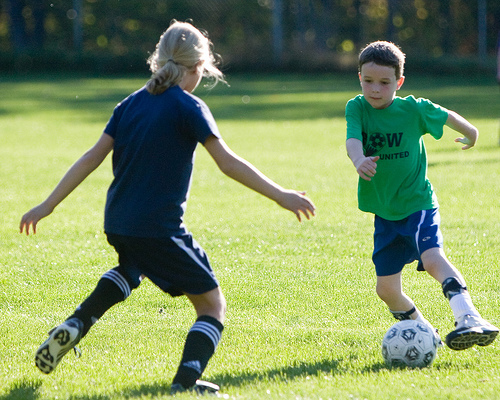 Even if your child is not a gifted athlete with oodles of balance or coordination, they will learn skills and lessons more effectively when they are somehow physically involved in the learning process. Want to learn activities you can do at home to strengthen your child’s kinesthetic skills?